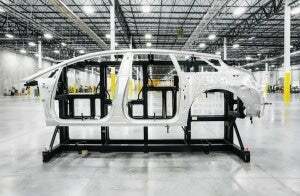 Faraday Future took another step toward production of its its FF 91 model, producing the body-in-white. Faraday Future, a startup company that is promising to build luxury electric vehicles, reports it has completed its first body-in-white as it prepares to complete building the company’s first vehicles this coming December. 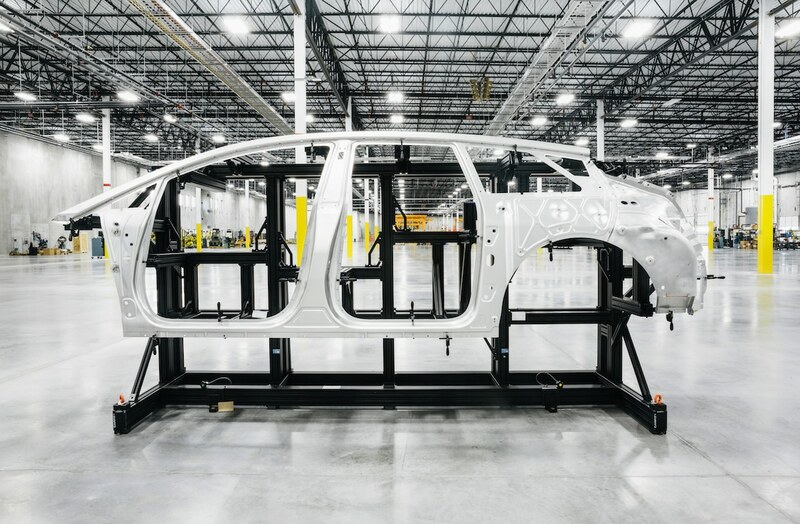 Faraday officials said completing the first body-in-white, which involves fashioning a vehicle’s basic framework by using welds and rivets to shape the structure, marks a milestone for the company on its way to producing finished vehicles. A number of key suppliers are working with Faraday at its Arizona factory to beat the deadlines, Faraday officials said. “This is one of many big milestones ahead for FF as we enter the final stage in introducing ‘our new species’, the FF 91 flagship. In the truest FF spirit, our teams and global partners have gone above and beyond to get to this important phase ahead of schedule,” said FF founder and Global CEO YT Jia. Faraday Future's FF 91 takes another step toward production, expected to start at the end of the year. “Everything we do relies on our proven User Planning To User approach. FF will redefine the meaning of customization at a whole new in-depth, high-end, and personalized level – each user in the near future will have the opportunity to provide input and witness the creation of their own personal FF 91 along the bespoke production line at FF Hanford,” he added. The order book for FF 91 early users has been open since the start of 2018 and first deliveries are due starting in December of this year through the middle of 2019. FF 91, first introduced to the public and media at the January 2017 Consumer Electronics Show in Las Vegas. Over the past two years, the FF91 has undergone intensive validation testing in all possible conditions to be certain that the final product exceeds the expectations of affluent buyers. Part of the frame of Faraday Future's FF 91. 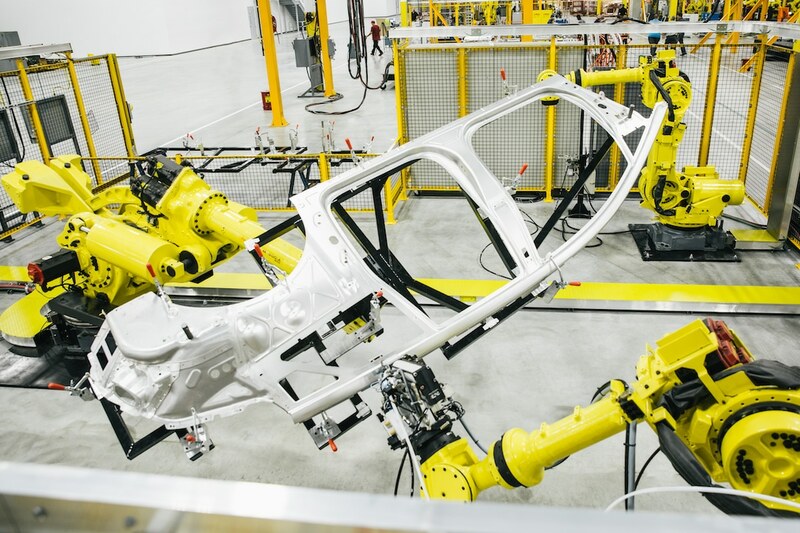 “There is no question that this team and our suppliers have faced many significant challenges in getting FF 91 to this point, and even slightly ahead of schedule,” said Dag Reckhorn, senior vice president of Manufacturing. This entry was posted on Friday, August 24th, 2018 at and is filed under Automakers, Automobiles, China, EVs, Electrified Vehicles, Faraday Future, Markets, Sales, Technology, Trends, U.S./North America. You can follow any responses to this entry through the RSS 2.0 feed. Both comments and pings are currently closed. Was Faraday the company that originally had a factory in (or near) Las Vegas, or am I thinking of some other EV manufacturer?